The biggest temple in this city is that of "Sarangapani" which rises upto 150 feet with 9 tiers. The bows held by Vishnu in different aspects carry different names. Rama's bow is called "Kothandam" and hence he is called Kodhandaraman. There is a bow called Sarangam and the lord who wields it is called "Sarangapani", who is housed here. Of the 108 "Divya Desas", the most important is Thiruvarangam. Next comes Thirumalai and the third is this Sthala. Another pecularity is the mentioned has been sung by eleven Alwars, the second by 9 and this by 7 Alwars. This temple too was renovated by Govinda dikshitar. This shrine had a special significance in the history of Vaishnavism. Sarangapani temple is the biggest Vishnu temple in Kumbakonam and it belongs to 13th century. The Moolavar is Sarangan ,and the thayar is Ranganayaki. 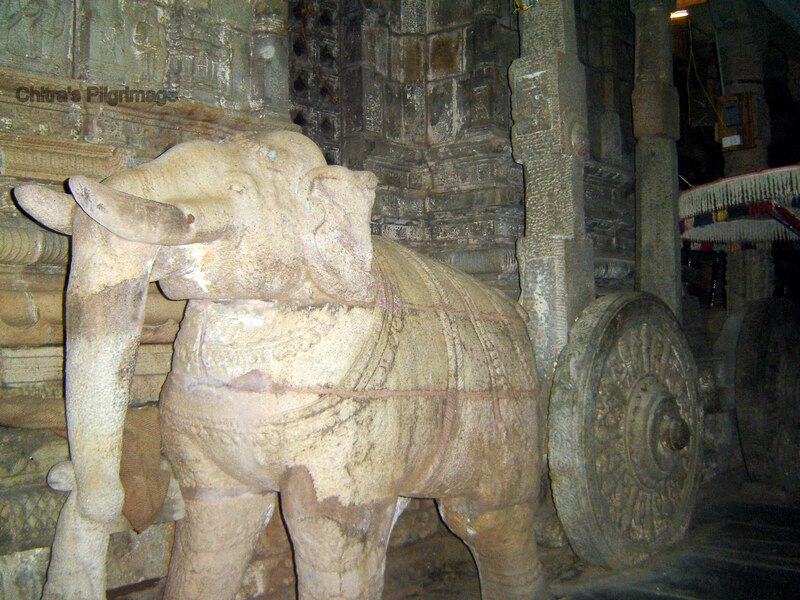 The temple sanctum is designed like a chariot with wheels and is drawn by horses and elephants. This is an important divya desam of Vishnu and is also known as Tiru Kudanthai. This is one of the Pancha Ranga Khestras ; Other four are temple of Sri Ranganatha; Sri Rangam, (near Trichy) Appakudathan temple, Tirukoviladi- Trichy, Parimala Ranganathar at Tiru Indalur (near Kumbakonam) and Sri Ranganatha Swamy temple at Srirangapatanam in Karnataka. When it was time for the destruction of this world a huge pralaya came up. In order to save the vedha's Amirtham and tools necessary to create lives on earth, lord Bhrama collected all these things and put them in a mud pot and kept the pot safety on the top of the Mountain Meru. Pralaya kalam (ie) the period of non stop heavy rain came and the pot of bhrama was washed away by the flood. In due course moving in the south direction it came to halt at a particular place. Then for the wish of all devar's (ie) heavenly people Lord Shiva broke the pot with an arrow. Immediately Amudham (ie) the liquit given eternity flowed from the pot and formed two tanks. One is known as Maha maga kulam and the othr Potramarai kulam. The remains of the pot and Amudham joined together to form "Lord Kumbeswarar". In the name of the broken pot (ie) Kumbam that place was clled Kumbakkonam or simply Kudanthai. Once there was a dispute between the rishis as to whom to submit the "Avirbagam" (ie) to whom they should give more importance among the trinity "Sivan, Bhrama and Vishnu". As they couldn't resolve the matter they sent "Brighu Maharishi" to test the Trinities and finally to select the best member. So, Brighu Maharishi went to Siva logam (ie) the place of Shiva and Bhramalogam (ie) place of Bhrama and was dishonoured by them. So angrily he went at last to Vishuloga (ie) the the place of Maha Vishnu. There too he wasn't honoured properly. So he got very angry and kicked Maha Vishnu's heart where Godess Mahalakshmi lives. But in turn Mahavishnu took the feet which kicked him and said "Oh! rishi you have kicked me, but I do not bother about that but your feet may ache due to this so let me soothe it." Saying so he tactfully took away the third eye of Brighu Maharishi which was conceled under his toe. Due to this Brighu Maharishi regained his temper and also lost his eye of Pride. As soon as he lost his pride he became very humble and pleaded Mahavishnu to forgive him. From this the Lord God has showed us that unless we lose our pride and become humble. What ever position we may hold, that would never fetch God towards us. Meanwhile, as Bhrigu Maharishi gave a kick where she lived, Mahalakshmi gave a kick where she lived, Mahalakshmi got annoyed and left the scene. She came to the earth and started to live at Kollapuram. Without Mahalakshmi the Godess of Money Lord Narayana was worried a lot and came to earth in search of his beloved wife. But as he couldn't find he, he transformed himself into Lord Srinivasa and married Godess Padmavathi. As Mahalakshmi left him he was not having enough money for marriage so he borrowed some money from Lord Khubera. Once again he was left alone for Padmavathidevi had a dispute with Lord Srinivasa and left Thirupati. By now, Mahalakshmi who was staying at Kollapuri came to know the news of Lord Srinivasa's marriage from Naradha. She became very angry and started to search Lord Srinivasa who had fled to Abyss (ie) paathala loga in Kumbakkonam, to escape from Mahalakshmi's angry. Goddess Mahalakshmi searched Lord Srinivasa every where but her effort gave her no fruits. So she became a small child and crawled as BalaKomalavalli in the Potramarai Kulam. Brighu Maharishi who kicked Mahalakshmi felt very much for his action and hence took rebirth as Hema Maharishi. He saw Balukomalavalli and started to bring her up as his own daughter. When it was time for Komalavalli's marriage, Hema Maharishi performed a very hard penance and pleaded Mahavishnu to accept Mahalakshmi. Lord Mahavishnu granted his wish. On a Mahashankaranthi day Lord Mahavishnu emerged out from Vaideha Vimanam contained in the pranava vimana of Sri Rangam and came in a huge chariot and married Komalavalli Thaayar. As the Thayaar Komalavalli was angry with Lord Srinivasa who has a standing posture to soothe her anger Lord Mahavishnu now adapted the sleeping posture of Ranganatha of Sri Rangam and became SaarngapaaNi in Kumbakonam. Actually Shargam is the name of the bow of Sri Rama, one of the ten Avathar's of Sri Mahavishnu. Sri Rama is very famous for his one man - one wife format of life. So on order to give assurence of Security for his wife Komalavalli Lord Mahavishnu has adapted the shargam in the name of Sri Ramam and the posture of Ranganatha so as to be called as "SaarngapaaNi". There is a "Paadhala Srinivasar" in this temple which remainds as the above tale. Goddess Mahalakshmi repented for her mistake and from then onwards she took a vow that she would never leave her dear husband. Hence even today she never leaves out of her chamber. So only she is called as "Padhi Thanda Patni". This place is treated equivalent with Thirupati, SriRangam, Kaattu Mannar Kovil, Alwar Thirunagari, Thruvellarai, Thiruvekka, Thiru Kandiyur, ThiruKarambanoor, Thiruputkuzhi and Thirupullamboothamkudi. This place is treated as the place which explains the meaning of Paramathma Thathuvam. The magical pot of Bhrama - Lord shiva who broke the neck of the pot - Lord Ranganatha who as Aaraamudhan also named SaarngapaaNi's marriage with Komalavalli represents the power of the trinity Bhrama, Vishnu and Sivan at a single place like the I which happend at Karambanoor and Kandiyur. Even then, this place is called as Bhaskara Shetram only. The combination of some hamsam's (ie) parts of Lord Shivan and Lord Vishnu is named as Lord Bhaskara. He has two heads and four hands. Two hands are used by him to pray Lord Shiva whereas the other two hands contain the lotus which represents Godess Mahalakshmi. Her body is of red colour, the colour of Lord Shivan and his ornaments are all of blue colour representing Mahavishnu. As the powers of lord Shiva and Vishnu has combined here this place is called as Bhaskara shethram. This place paves a way to the unison of Shaiveties and Vaishnaveties. 06:00 AM - 12:00 Noon ; 04:00 PM - 08:00 PM. In the sanctum there is a beautifully carved out 12 pillared mandapa going by the Tirumamani mandapam reminiscent of the similar Mandapa at Sri Vaikuntha and hence it is axiomatic to call this kshetra a Bhuloka Vaikuntha like Sri Rangam. The immensely lofty tower 150 feet in height and 90 feet and 51 feet in length and breath shall speak a lot about the grandeur of the gopuram and the splendour of Sri Sarangapani who abides therein. There is no Paramapadavasal to the temple. The Uttarayana and Dakshinayana are the two gateways of this temple.The one in the north will be open from 14th January to 15th July and the one in the south from 15th July to 14th January. So it is indeed meritorious to enter through either of these two gateways for worshipping the Lord.